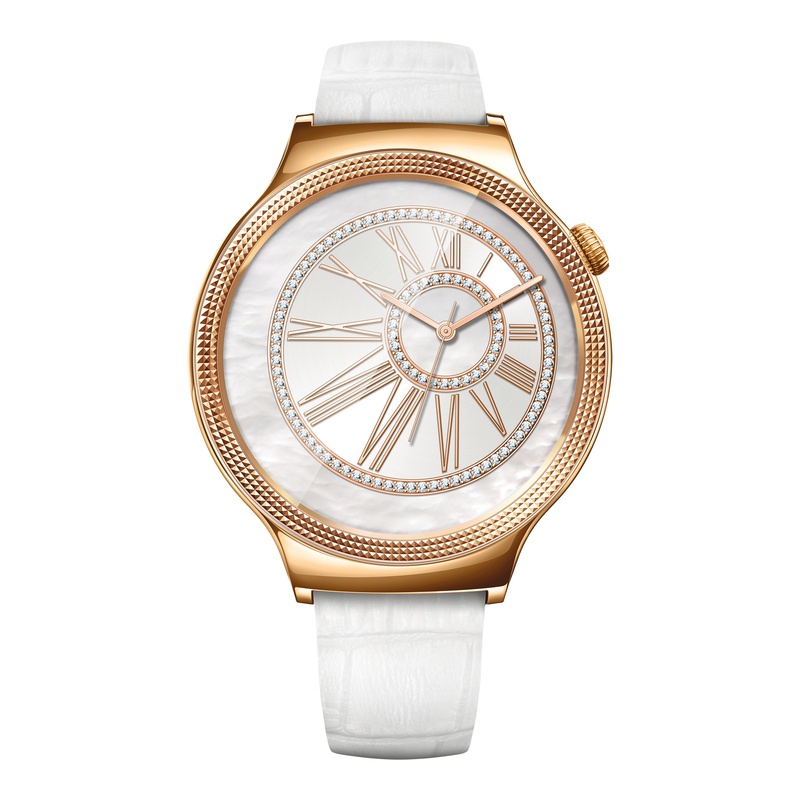 If you ask me, the Huawei Watch is one of the classiest Android Wear devices on the market right now. The stainless steel one with the mesh band on my wrist would duel you to death if you dared to disagree with that statement, and so would everyone who has seen it in person. But that doesn't mean that Huawei is resting on its laurels or not working on churning even better looking variants of the watch. 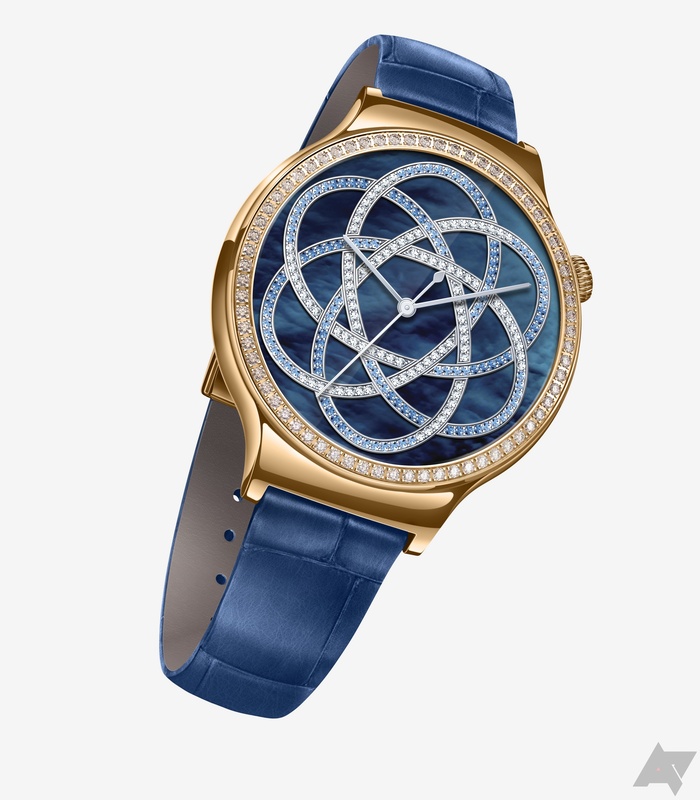 Enter Jewel and Elegant, two new Huawei Watch designs that take the same fully rounded 1.4" circular AMOLED screen with the 2 o'clock crown button and add a touch of more feminine glamour. Elegant introduces a new bezel pattern: instead of the radial ridges seen on the previous rose gold variants, it has a dotted/square pattern that's reminiscent (but not identical) to the knurl pattern seen on the second generation Moto 360. Jewel has incrusted diamonds (or other shiny rocks) in the bezel. Both appear to be the rose gold plated variant of the Huawei Watch, but they could still be just plain gold plated — it's difficult to differentiate between the two in press images. They come with leather straps and there doesn't seem to be an all-metallic version of either of them. 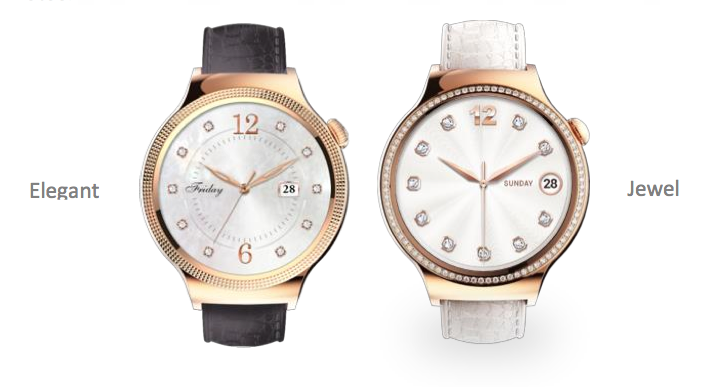 Aside from the visual modification, Jewel and Elegant will both be slightly larger than the regular Huawei Watch. The face is 44 x 44 mm instead of 42 x42 mm, but the thickness remains the same at 11.3 mm. Specs are unchanged: Snapdragon 400, 512MB RAM, 4GB storage, 300mAh battery, sensors... Pricing hasn't been divulged yet, but you can expect these two to be available sometime in Q1 2016 on the various outlets where the Huawei Watch has been selling. Huawei has released the official press release for these two watches. 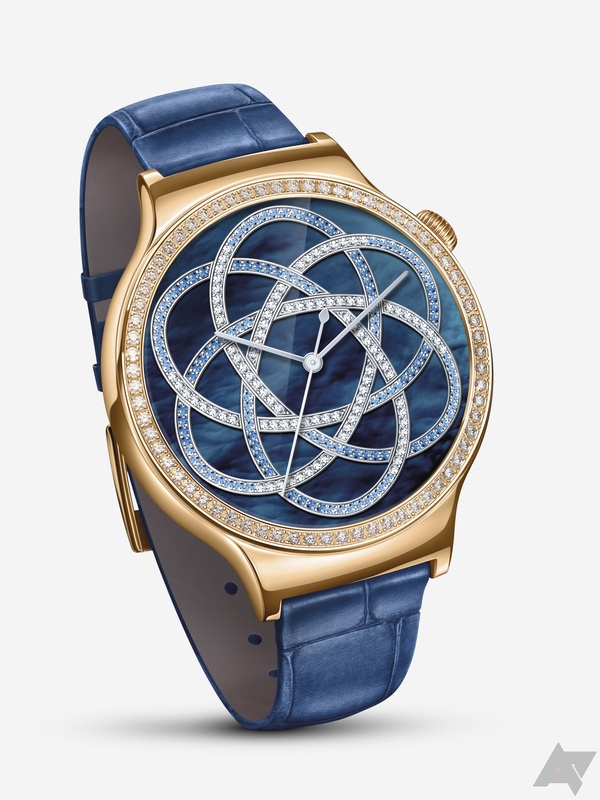 We now know that the Jewel has 68 Swarovski Zirconia gems encrusted in its bezel, that there are 10 exclusive watch faces for both models, and the dark leather option is actually a nice blue one. Pricing is $499 for the Elegant and $599 for the Jewel as per Huawei's CES press conference.